McFarland, J., Cui, J., Rathbun, A., and Holmes, J. (2018). Trends in High School Dropout and Completion Rates in the United States: 2018 (NCES 2019-117). U.S. Department of Education. Washington, DC: National Center for Education Statistics. Retrieved 12/2018 from http://nces.ed.gov/pubsearch. While advocates for increasing graduation rates tend to focus on the moral argument that all children deserve a quality education, they could just as easily look at compelling bottom lines in terms of costs to the individuals and society. Note: The percentage with a professional degree is not statistically different from the percentage with a doctoral degree. 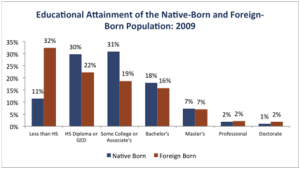 Data from U.S. Census Bureau, American Community Survey, 2009. Reformatted and presented by the National Dropout Prevention Center/Network from: U.S. Census Bureau. 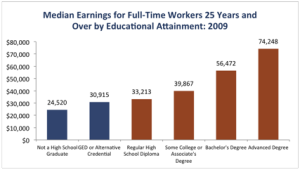 Educational attainment: Five key data releases from the U.S. Census Bureau. Data from U.S. Census Bureau, Survey of Income and Program Participation, 2008 Panel. Reformatted and resented by the National Dropout Prevention Center/Network from: U.S. Census Bureau. 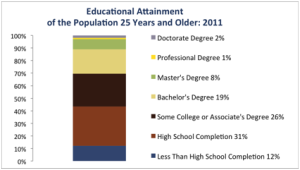 Educational attainment: Five key data releases from the U.S. Census Bureau. Link to the statistics in a particular state through the State Education Agency’s website. Here is a list of connections to each state. At any given time in a student’s life he/she can become “at-risk.” One must look at a variety of situations and life factors to determine at-riskness. Not all students who are identified as being at risk dropout and so it is important to realize that this is a multidimensional concept that has no set rules. Reardon, S.F., & Portilla, X.A. AERA Open. (2016). Recent Trends in Income, Racial, and Ethnic School Readiness Gaps at Kindergarten Entry. Education Commission of the States. (2015). Free and Compulsory School Age Requirements. Butrymowicz, S. (2015). The Graduation Rates From Every School District* in One Map. U.S. Department of Education (2013). Adjusted Cohort Graduation Rates at the school level: School Year 2010-11. National Center for Education Statistics (2012). Public School Graduates and Dropouts from the Common Core of Data: School Year 2009–10. Chapman, C., Laird, J., Ifill, N., & Kewal Ramani, A. (2011). Trends in High School Dropout and Completion Rates in the United States: 1972–2009. National Center for Education Statistics (2010). 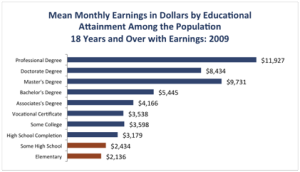 Digest of Education Statistics, 2009. National Center for Education Statistics (2010). Public School Graduates and Dropouts From the Common Core of Data: School Year 2007–08. U.S. Department of Education (2009). Dropout Rates in the United States: 2007. U.S. Department of Education (2008). Dropout Rates in the United States: 2006. ECS StateNotes (2006). Compulsory School Age Attendance Requirements. U.S. Department of Education (2006). Dropout Rates in the United States: 2004. Alliance for Excellent Education (2006). Who’s Counted? Who’s Counting? Understanding High School Graduation Rates. National Dropout Prevention Center/Network (2005). Selected Facts & Statistics.